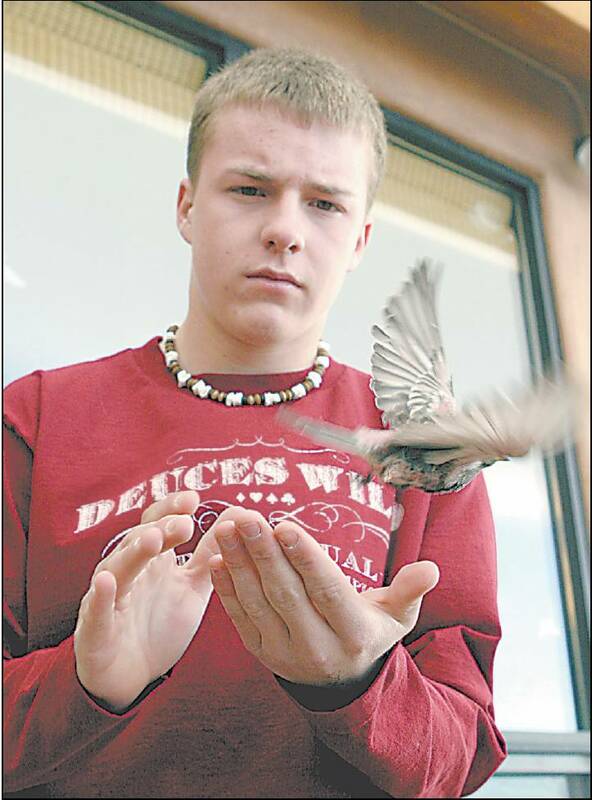 Above is a photo (courtesy of Hans Spiecker) of Ryan Beaulieu, the teenage rosy-finch researcher who was killed in August of 2005. A couple of things happened this week that brought Ryan vividly to my mind. Usually, about three quarters of the newly banded birds are Black Rosy-Finches. The proportion of the Brown-capped and Gray-crowned species varies rather widely, with Brown-capped unusually numerous this year. 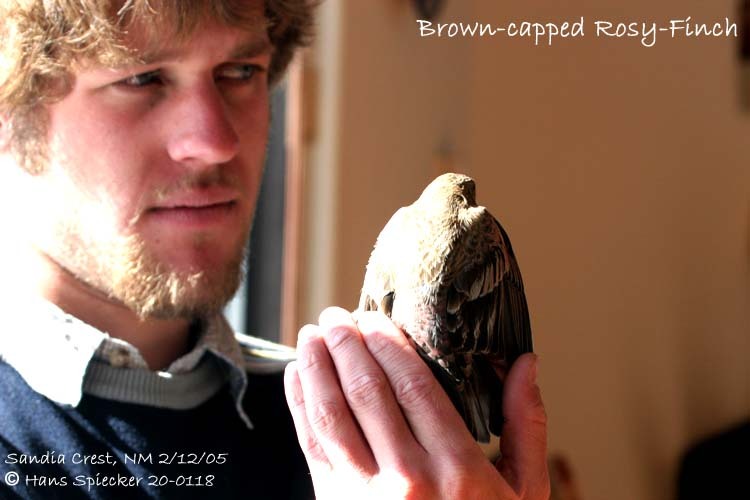 Although this species breeds fairly nearby in the Southern Rockies, they were rare to absent a couple of winters.During the winter of 2004-2005, they appeared in force, and 50 were banded. 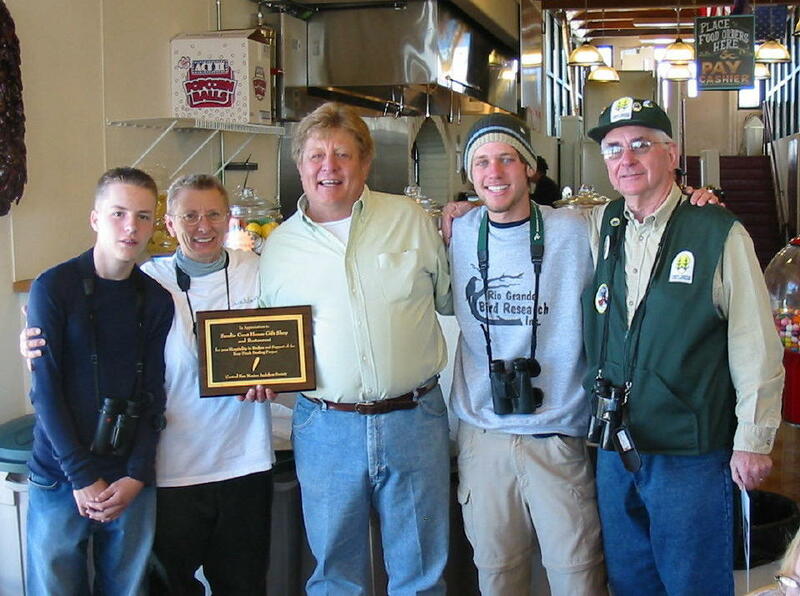 Spiecker’s memorable photo was taken at one of that winter’s final banding sessions. Above is Michael Hilchey’s photo (from Flickr) of the traps used by the banders. Over 1500 have been newly banded since 2004. Below, Raymond Van Buskirk, another of Ryan’s close friends, carries on his legacy, adding his enthusiasm and drive to this very significant research effort. 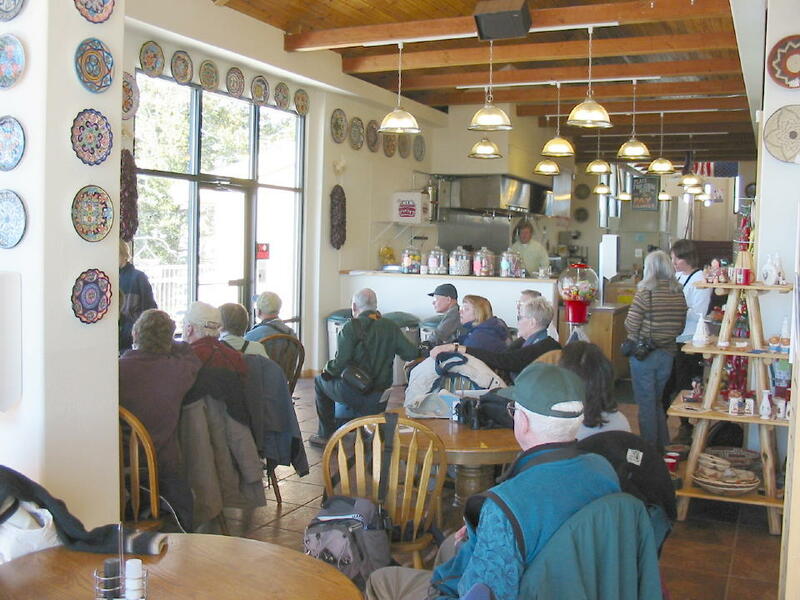 Central New Mexico Audubon Society presented a certificate of appreciation to Crest House Manager Gene Romero (center). Flanking him, left to right are Raymond, CNMAS President Beth Hurst-Waitz, Ryan and Ken. We have had a wonderful week-long visit from our Chicagoland grandchildren and their parents. Yesterday we capped off their visit with a boating excursion in the waters around Marco Island, Florida. After we cleared the dock at The Isles of Capri Marina, we headed for some fishing in one of the the small bays behind the Gulf of Mexico barrier islands. Gracie is pointing out the route towards the south– the upside down map is not a mistake! The weather was fabulous. We headed out for the fishing grounds, keeping an eye out for dolphins. The girls helped Papi steer the pontoon boat. Gracie caught the only fish of the day, an eel. She grasped it and exclaimed that it was “slimy and yucky” while her little sister was much more cautious. We grounded our boat on a beautiful white sand beach opposite Little Marco Island. On the way back we saw several dolphin. It was an exciting experience for the children. Our daughter’s family flew in yesterday from very cold Chicagoland, and our two granddaughters (ages 2 1/2 and 3 1/2) were absolutely thrilled to see green trees and the sparkling blue water of our “lago grande.” It was quite a change from snow and near-zero temperatures. They held hands and danced in a circle, singing, “Florida, Florida, we love Florida!” This morning they were up early, anticipating a walk through the neighborhood. The girls were thrilled to view the eagle through my spotting scope. It flew away after about a half hour, and we went on our walk. Even before we left I had added several new birds to my daily total: Boat-tailed Grackle, Rock Pigeon, Muscovy Duck (the latter not countable by American Birding Association standards, but hey, my “other” RDA includes a few synthetic vitamins! ), Tricolored Heron, Loggerhead Shrike and Blue Jay. We were hardly out the front door before a Ring-billed Gull flew over. The girls herded a small group of juvenile White Ibis across a neighbor’s driveway. Nine species in no time at all! Back at the house, the girls had fun feeding the patos. The older granddaughter, clutching a white feather, picked up a rock at the water’s edge and immediately saw that it was unusual. She surprised me by saying “This rock is from ages ago.” Sure enough, it contained the fossilized shell of a scallop. Lake Okeechobee is a good indicator of our lack of rainfall. Lake levels have been falling for the past two years and have reached record lows. Our little lake is down nearly four feet. We are restricted to watering lawns only once a week. A few days before Christmas, this beautiful sunrise over our backyard lake seemed to promise some relief, outlining the anvil heads along the ocean front. The showers never ventured onto land. The lake was still. The lack of aeration from rain and wind drove the fish to the surface, gulping for air. A Great Blue Heron was attracted to the shoreline near the gasping fish, but settled for a few fingerlings. We walked the boardwalk at Chapel Trail Nature Center. We saw few birds. This Tricolored Heron stands watch in the still morning air. In mid-October, we visited nearby Chapel Trail Nature Center in Pembroke Pines, FL. It is a peaceful bit of restored Everglades, surrounded by development that is picking up pace. The outer extent of the boardwalk was overturned by Hurricane Wilma, but beautifully repaired, with minimal damage to the wetlands. The storm felled all the big snags that had been used by Bald Eagles and other raptors. The area is most interesting during both spring and (especially) fall migration. During past visits we have seen Limpkins, American Bitterns, Swamp Sparrows and Marsh Wrens. Exotic Purple Swamphens had extended their range into the area during the past year, but probably were gunned down in the extermination program. Several Common Yellowthroats and Carolina Wrens were about. This Prairie Warbler approached us closely. A Magnolia Warbler eluded us for quite awhile, but finally emerged for this shot. So far, we had seen nothing out of the ordinary. After we walked the length of the boardwalk and started back, something caught my eye. Next to the boardwalk, a vine with yellow flowers was winding its way through the branches of a tree that had red berries. Suddenly, I was surprised to see something very unusual, or so I thought at the time. One of the flowers on that same vine looked as if it had gobbled up some of the berries and appeared to be engulfing and absorbing them! Its petals were swollen and turning orange, perhaps from the red color of the juice of the hapless berries it had engorged. A vegetarian plant? Wow! I had never heard of such a thing. Of course, I snapped a few photos for posterity– was this incident new to science, and never to be seen again? I looked more closely. Indeed, some of the red berries appeared to be partially digested. A gruesome sight! “The bitter melon or balsam pear (Momordica charantia Linnaeus) is a cucurbit, a member of the Cucurbitaceae. Native to the Old World tropics, it was introduced and has naturalized throughout the subtropics and tropics worldwide. Balsam pear was probably introduced to the Caribbean and Florida by slaves brought from Africa for the sugar plantations. “Each node along the vine has a deeply lobed leaf and a tendril. Like other cucurbits, bitter melon is monoecious bearing staminate (male) and pistillate (female) flowers in the axils of the leaves. Bees are the primary pollinators. After pollination, a small fleshy gourd forms. When ripe, the gourd turns yellow and splits exposing the red aril-covered seeds“ (My emphasis; according to Wikipedia, an aril is a fleshy covering of certain seeds formed from the attachment point of the seed). “The immature gourds, those that have not turned yellow, are used in Asian cooking. They are an excellent source of vitamins A and C, iron, and carbohydrates. But long ago in Africa, India, and China, the leaves and ripe gourds of bitter melon joined those plants found useful as medicines. “In Jamaica, a tea of ‘cerasee’ leaves is said to improve “bad blood” and ease gripes (spasmodic pains of the large intestine). In Ayurvedic medicine, ‘karela’ fruit is considered ‘cooling’ and provides a treatment for anemia and other blood disorders, stomach problems like ulcers, upset stomach, and lack of appetite, asthma, bronchitis, and fever. In traditional Chinese medicine, ‘fu gua’ is used as a hypoglycemic agent (reduces blood sugar levels). “Bitter melon is currently under study as a complementary drug in the treatment of diabetes both to reduce glucose levels and oxidative stress (antioxidant), as an antiviral therapy for HIV infection, and as a cytostatic (stops cell growth) in certain cancers.